I think I mentioned in the past that I really hate painting… particularly walls, and trim, and doing the edging. I don’t like the mess, the fact that it takes two coats usually and I have to wait for the first one to dry, it’s never a one day project and the whole room is in disarray. Now, I do love the end product, but the process is painful for me! But… I didn’t do that this time! I decided not to paint the wall, but use what is already there and decorate around it. Not having to purchase paint is also a huge money saver especially if you want low VOC paint! So why is this post titled painting? Well… a generous friend saw my post on freecycle asking for paint. She had LOTS and invited me to come over and “shop”. I did and boy what a blessing! She gave me a small can of dark green which was almost empty, an off white which we poured in a 10 oz jar and another 12 oz jar of bright blue which we added some lighter blue and cream to tone down and thin out (since it was a bit on the thick side!). These three small cans/jars was the perfect amount! 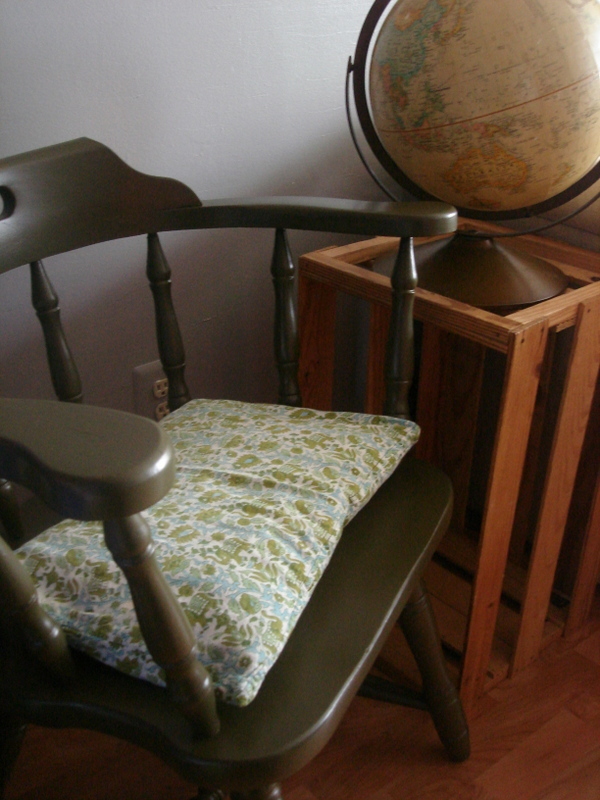 I painted the brown chair green which I posted about earlier. I painted an end table which Brian found on the side of the road a few years ago. I used the blue and accented the scrolling with a few touches of white… literally. I dipped my finger in the cream color and dabbed it over the blue paint on the scroll work. I also left the handle unpainted and left the inside and top white as well. I also painted some candle sconces that I found for FREE at a clothing swap. 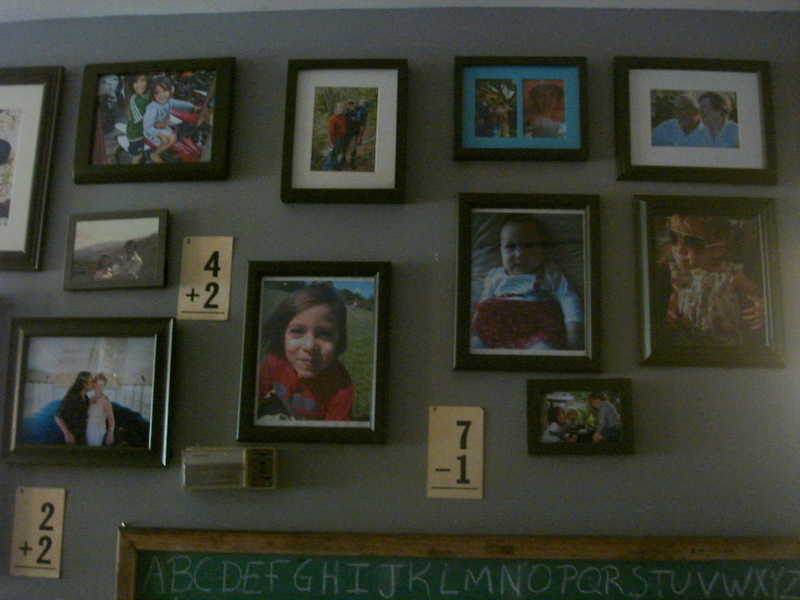 I LOVE these on the wall and were just what I envisioned. I didn’t take a before photo, but they were a brass color and definitely didn’t go with the room. 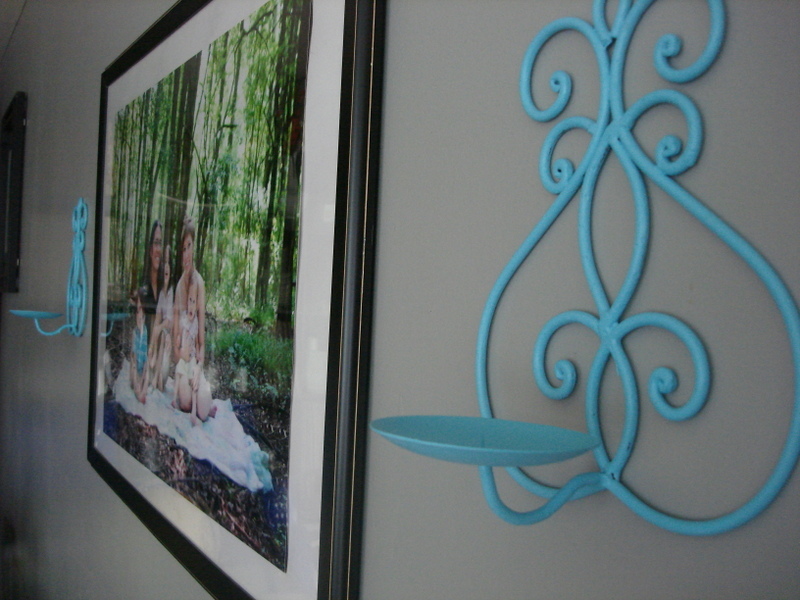 I also painted a bunch of photo frames for the school room and used the dark green to carry the color over with a splash of blue. And lastly I painted a dresser and side table. This dresser I found on a ‘curb alert’ post on craigslist. All of the drawers were broken, or falling apart, but handy hubby was able to reglue them and piece them back together. I then did the painting and it turned out fantastic! 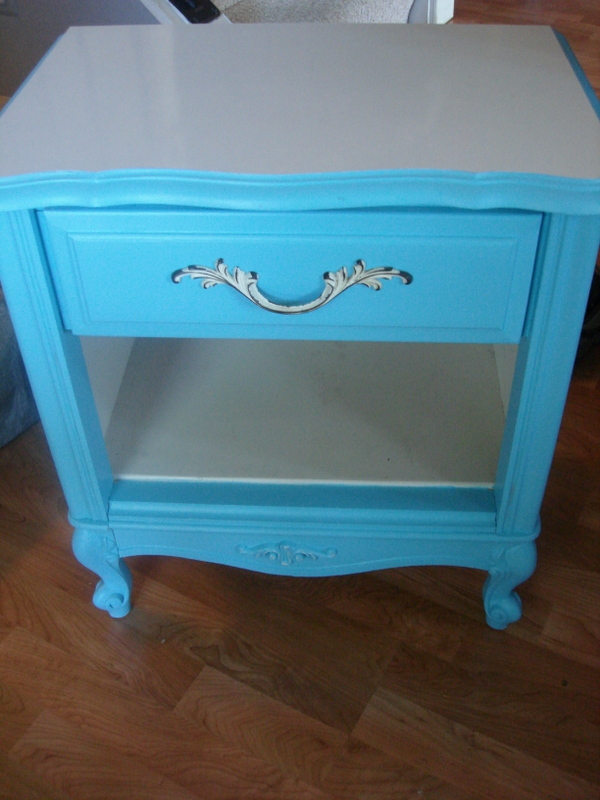 The side table I found for our bedroom in a trash pile in our neighborhood and I painted that blue as well! However… next week I will post on the bedroom updates and you will get to see the dresser and side table! So… all that to say, I still did lots of painting for about 2 weeks and have had partially painted projects laying all over the house! It has been a disaster and I’m REALLY looking forward to having things put back together. Mess stresses me out! Even with all the work and crazy piles and projects I’m super thrilled with how it has all turned out. I only spent $4 for each room since the pain was given to me and a few pieces of “new to us” furniture was found for free as well! 😉 And… if the items I removed from the room before redoing it sell on craigslist then I will make about $52 which is a prophet of $48 on redoing a room! 😉 LOVE it! Have you had any fun projects lately you wanna share?! I’d love to hear and get some new ideas!